How do you know the difference between giving your kids a healthy push to get over their fears or whether you’re pushing them over the edge and into Paranoiatown? My hubby and I found that line can be fine when we had a recent hiccup at swimming lessons. Logan at 10 months. He's always loved swimming. 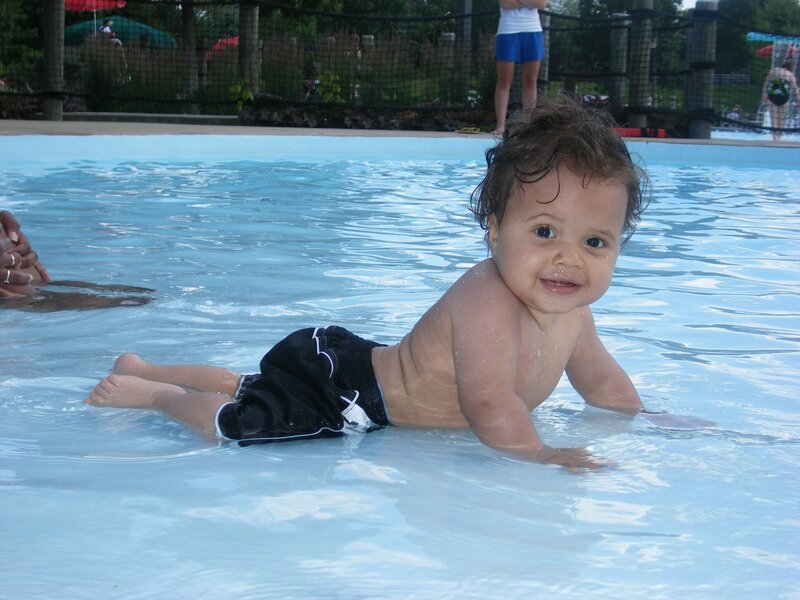 My 3-year-old Logan has been in swimming lessons at the park district on and off since he was six months. They are so much fun, you get in the water with your babe where through games they learn how to kick, stroke and use flotation devices. Hubby recently enrolled him in swim classes at our gym, it was closer and cheaper, plus the class sizes were smaller. Sounds like a win, win, win, right? Well it wasn’t. Hubby got in the water around 10 a.m. with Logan and our gym’s pool is apparently freezing, but the boys splashed on. After about 15 minutes no one else was there and Hubby began to suspect something was off. Just before 10:30 a.m. little tykes in swim gear started to show up with their parents, but these parents were fully clothed. Turns out these kids were pros. They didn’t get in the water with mom or dad because they were miniature Michael Phelps. Poor Hubby, as he stood there all pasty and wet, the parents looked at him like who’s this half-naked fool? The kids were given towers to stand on since the pool is so deep, but Logan refused to be in the water without his dad. Hubby just stood near Logan while the instructor worked with him on different techniques. After the class they came home and though Logan said he had fun, he didn’t want to go back into the water by himself the following Saturday. Hubby and I began to wonder, how hard do we push him to do this? We both liked the idea of getting him out of his comfort zone to stretch as a person, but as the days went on, Logan turned more and more against swimming alone. He said he was afraid to get in the water without his dad because he didn’t want to fall. Rather than give him a complex, we decided to enroll him in another class where parents were allowed in the water. The day of the new swim class, Logan refused to even go swimming. That’s where Hubby and I drew the line, we didn’t feel he had to swim solo, but he did have to swim. Hubby tried to convince him to go to class and all he got was a spectacular tantrum. About an hour later, I gave it a go. I dug deep in my mommy bag of tricks and pulled out all that I had. I prodded him, guilted him, pressured him and was about to bust out the brass knuckles when I got the idea to appeal to his altruistic side. I told him how his favorite boat wanted to go to swim class, but needed Logan to take him. My guy fell for it hook, line and sinker. Hubby, Logan and the boat all got in the water that day and returned home excited for the next class. I’m glad we didn’t force him to take the plunge solo, but am happy we pushed him to take another dip. I hope that the next time he needs a little push, we hit the right buttons. On Nov. 9, 2010 an amazing woman died. Her name was Danyale Ellis and she was my friend. Last weekend was her funeral and I wondered, do I bring Logan or is that inappropriate? Hubby was out of town and I really wanted to attend Danyale’s funeral. She was only 38 years old and one of those people that the rest of us strive to be. She was successful, but not in a nauseating way, because she was humble. What I liked best is that she was very understanding. She understood my hectic life and never made me feel bad for not doing something, she simply cherished what I could. That’s rare. We were both in the same sorority, Delta Sigma Theta Sorority Inc. and before you judge, it’s not the kind of sorority where cheerleading pixies prance around in an oversized white house. It’s a predominantly black sorority dedicated to public service. (Though admittedly there’s former cheerleaders in our midst too…) Danyale and I met in the alumnae chapter. It was important to me that I pay my respects, but I was failing at finding a sitter for Logan. Would it be weird to bring my boisterous boy to a funeral? What if he had a colossal meltdown in the middle of a tear-jerking eulogy? Saturday morning I decided I would regret not trying to attend the funeral more than regret an ill-timed tantrum. On the way to the services, I started to lay out my expectations of Logan, telling him we were going to a funeral and he was to be quiet, if he wanted to talk to me it was to be in a whisper. He asked me what’s a funeral. I paused, I had been so obsessed with figuring out the logistics of getting to the funeral I didn’t even think about how it would mean talking about death with my 3 year old. Such a small word, such a big question. I didn’t delve into a circle-of-life diatribe a la Lion King, I simply said: “I don’t know, God decides that.” Thankfully that seemed to answer the question good enough. We went to the funeral and he was spectacular, quietly played with his miniature cars in the pew and whispering so low I could barely hear him. The service was moving and whenever I felt the tears well up, I’d give Logan a squeeze and draw some strength from him. I was glad he was with me. When talking to Hubby on the phone that night, Logan excitedly grabbed the phone and said: “Daddy! Guess what? Somebody DIED today! “We went to Danyale’s funeral.” I said into the phone and heard his sigh of relief. It looks like I’ll get my Huxtable moment after all.